Tulsa Attorney BlogCan I Get A Tulsa Public Defender if I Post Bail? In Oklahoma criminal cases, a basic rule of thumb says if you can make bail, you can afford an attorney. When you need a court appointed attorney, your best strategy could appear to be waiting in jail so you can be represented by a public defender. That would seem to mean a person who posts bond cannot get a court appointed attorney. It is not so simple. Maybe they can, maybe not. Let me tell you why. The presumption that a person who posts bond is not indigent is a rebuttable presumption. That means a person who cannot afford an attorney may still get a public defender in Oklahoma even if they posted bond. 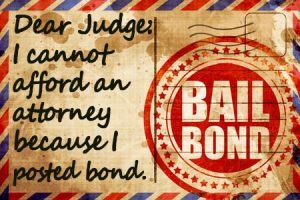 When a court presumes a defendant can hire a lawyer because they posted bond, without first inquiring about their financial status, whatever the court does while the defendant does not have a lawyer in court could be reversed. In Smith, the court reversed judgments and sentences in two cases where defendants had been denied court-appointed lawyers after they posted bond. They had been sentenced to 14 and 15 years in prison on a slate of charges that included manufacturing methamphetamine, child endangerment and DUI. The appeals court granted them new trials. Defendants also have a right to an attorney at probation hearings where there is an application to revoke a suspended sentence. Even if a person arrested for a probation violation posted bond, a court must inquire about the person’s ability to hire an attorney. In 2015, the Oklahoma Court of Criminal appeals cited Smith when it reversed a Kay County courts decision to revoke eight years of a suspended sentence because the court had denied the defendant court-appointed counsel. The Kay County court’s error was based on a presumption that the defendant could afford a lawyer because she had bailed out of jail. The court did not bother to ask the defendant if she had money for a lawyer. The defendant – in an appeal filed pro se (without an attorney) argued that the 14th Amendment of the U.S. Constitution and Article II of the Oklahoma Constitution guarantee the right to due process, which includes the right to be represented by an attorney in criminal proceedings. If a person has been released on bond, the Oklahoma Indigent Defense Act says the Pauper’s Affidavit must also include a statement that the applicant has contacted three licensed Oklahoma attorneys yet was unable to obtain representation. A court considers a person’s qualification for court appointed counsel based, in part, on the ability to post bond and decision to do so, whether any personal or real property can be liquidated to pay for an attorney, outstanding debts, financial history, earning capacity, living expenses, and availability of family members who can or will assist with legal costs. A finding of indigence may later be revised. A person may be ordered to repay the costs of a court appointed lawyer if the court later finds they have the ability to pay. While Courts decide whether someone can afford an attorney based in part on the person’s ability to make bail, whether a person can or should pay an attorney can be a more difficult question for the person facing criminal charges. Even if the person might bond out and still get a public defender, a private attorney might offer a different caliber of legal representation. Funds spent on bail bond can be effectively wasted if the person loses a court case and gets sent back to prison. In some circumstances, it might be best to invest in legal representation first, and consider posting bond later. When the risk of a lengthy prison sentence or the high cost of a bail bond outweighs the inconvenience of waiting in jail, an attorney can be a better investment. The services of a good Oklahoma defense attorney might mean the difference between a few weeks in jail before trial and a long stretch of prison time after losing at trial. Likewise, when charges might inevitably lead to jail time, a person might want to invest in an attorney. It might be better to get jail time out of the way while waiting for court dates, then let a qualified attorney reach a plea agreement for time served. For indigent defendants represented by a public defender, a plea bargain is often their best hope. A private attorney with more resources to invest in investigation and legal research might eventually reach a better agreement, or persuade a court to dismiss charges altogether. Even when a person is wrongly accused, a criminal charge can be emotionally and financially devastating. Your best defense against the emotional ravages of a criminal charge is to have an legal advocate who provides the skill and knowledge to help you regain control. Likewise, you make the best financial choices when you know what your options are in a criminal matter. To help you decide how to confront a criminal charge, Wirth Law Office provides free consultations with a Tulsa criminal defense attorney familiar with the Tulsa court system. To set up your free consultation, call Wirth Law Office today at (918) 879-1681 or send your question using the form at the top of this page.